When I think holidays, I think of dinners with my family, cooler weather, all of my favorite colors and lazy weekend brunches. These aren’t the brunches of summers past where you sip refreshing mimosas and wear shorts and tank tops, though, so those recipes just won’t do. 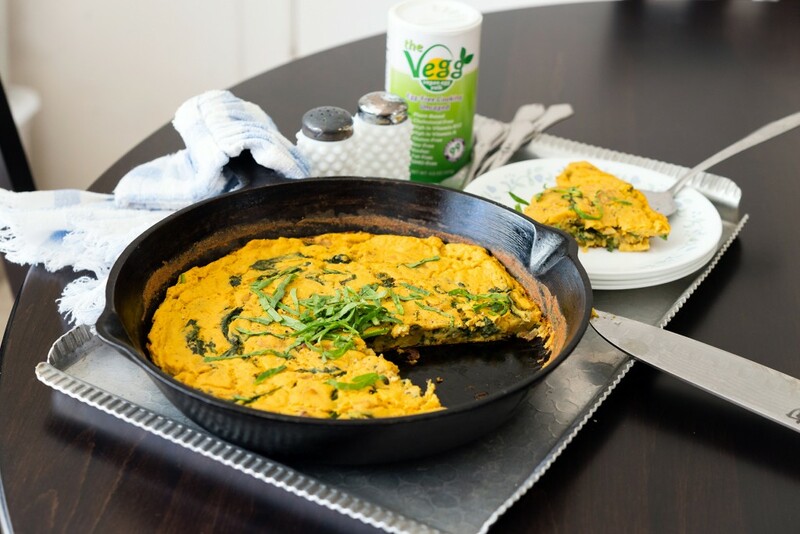 This vegan Spinach and Squash Frittata recipe featuring The Vegg will help you welcome in cozy sweaters and warm cups of coffee (with kahlua, duh). Feeling warm and snuggly yet? If not, I have the perfect dish to get you into that space; this easy-to-make and satisfying Squash and Spinach Frittata. This recipe uses seasonal delicata squash, caramelized onions and some spinach for color, while the base is a soy-free chickpea flour mixture. 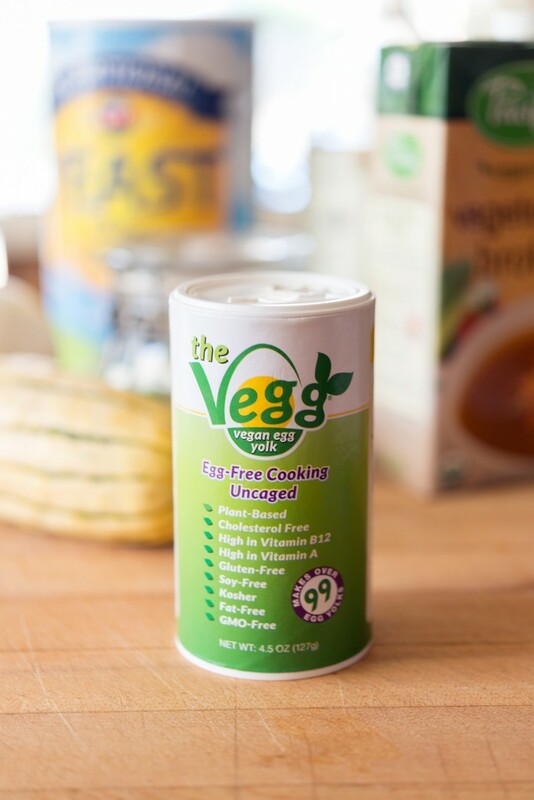 One thing that sets this apart from your standard vegan frittata is The Vegg used to give it an eggy flavor; this product has simple ingredients and is great in many dishes. 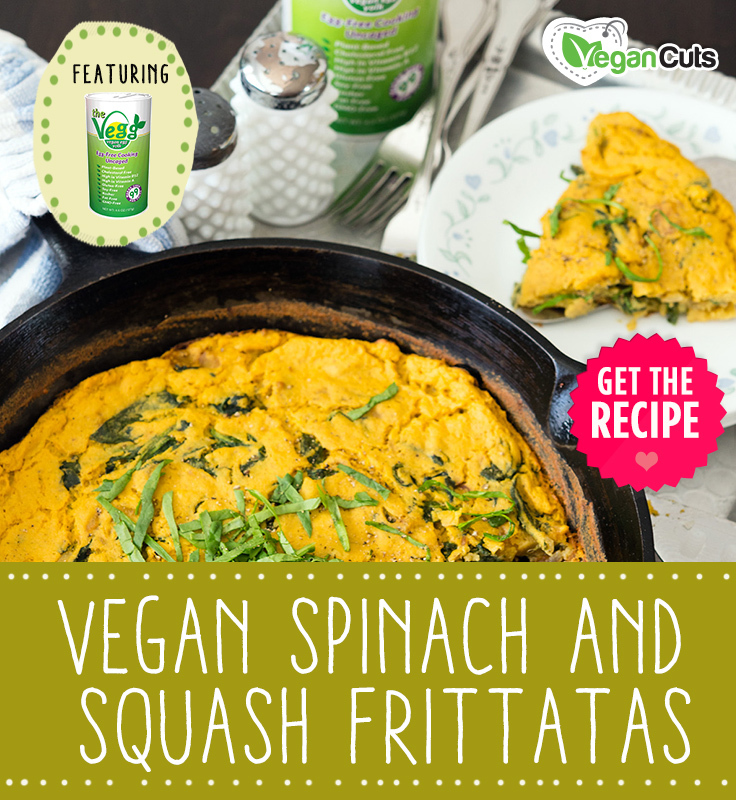 I’m even going as far as to say that this frittata is omnivore approved! Slightly eggy, with chunks of yummy squash and the boom of flavor from the onions make this a brunch star. I recommend making this dish in a cast iron pan, as it easily goes from stove to oven and looks pretty sweet when serving. 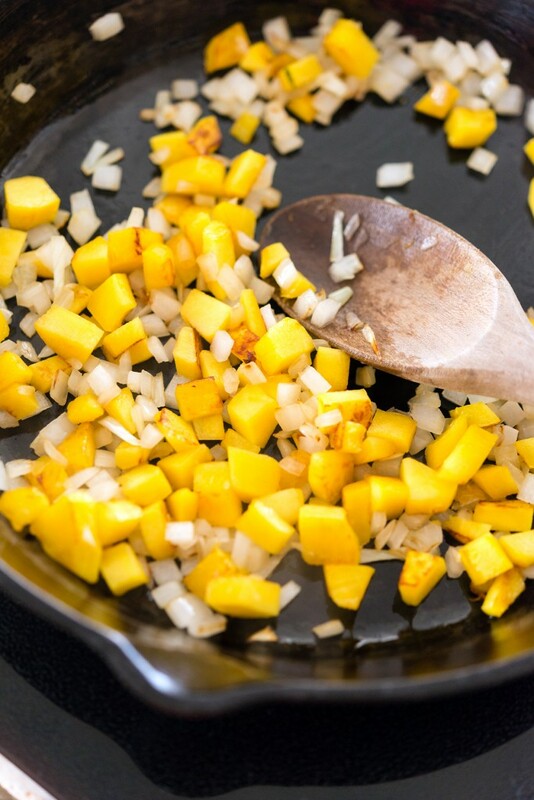 If you don’t have a cast iron pan, you can cook the vegetables in a sauté pan then stir them in with the egg filling and pour into a small casserole or baking dish of similar size. 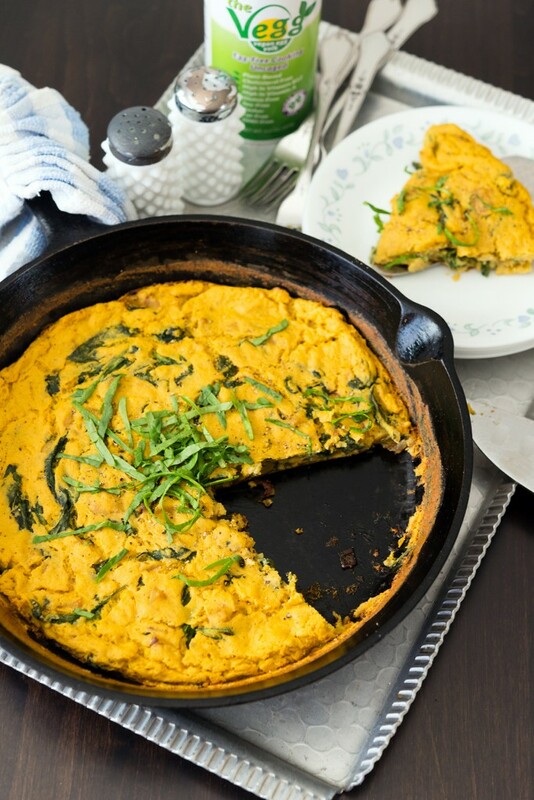 A warm, delectable frittata perfect for Fall and Winter brunches. 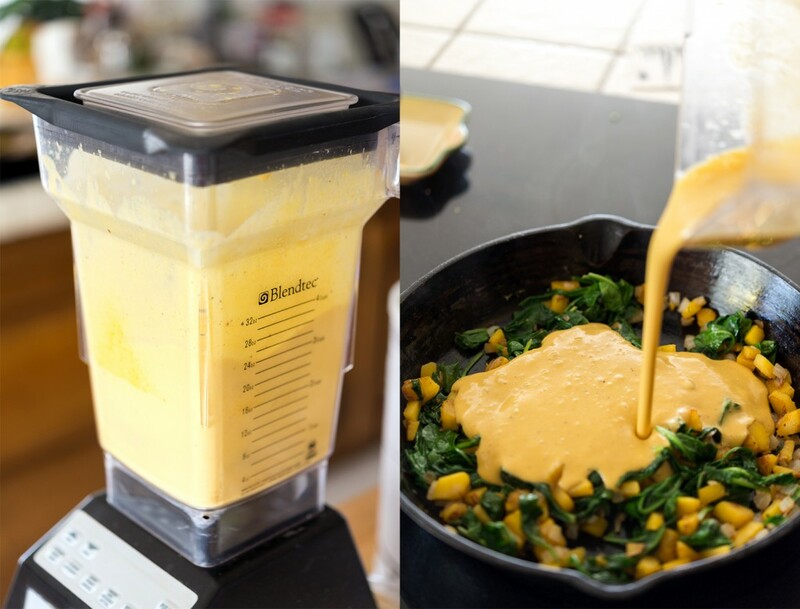 Place all of the Vegg mixture ingredients into a blender and puree until smooth. Set aside. Warm the oil in a 7-8" cast iron skillet over medium heat. 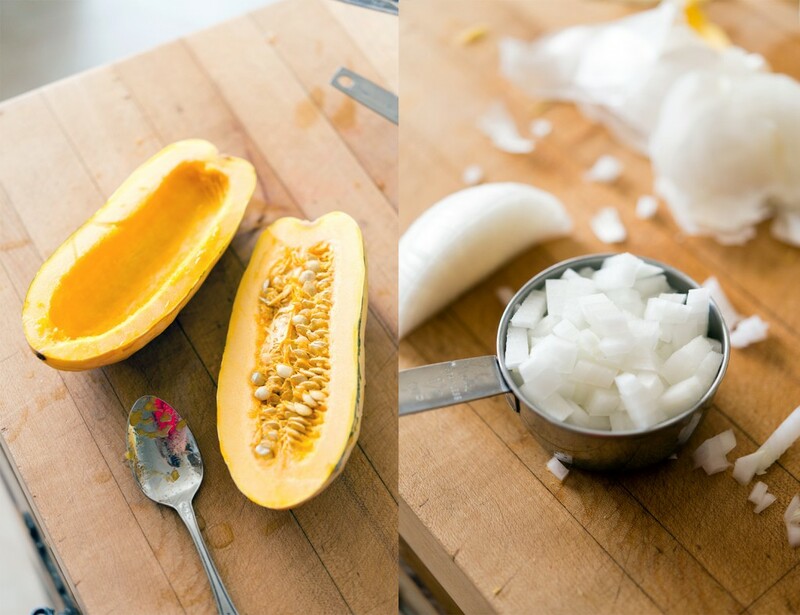 Once hot, add the onions and squash to the skillet and sauté the squash and onions until they have browned. Add the baby spinach into the skillet and stir together until wilted and season sauté with salt and pepper. Pour the Vegg mixture over the sauté and stir together so that the veggies don't fall to the bottom of the skillet. Adjust stove temp to medium-low and cook until the edges have browned slightly. Transfer skillet to oven and bake for 20-25 minutes, or until the top has become firm and golden. If you used a smaller skillet, it may take longer because your frittata is thicker. Take out of the oven, garnish with chiffonade cut baby spinach and set on cooling rack for 10-15 minutes before serving. Jackie Sobon is the chef and photographer behind the blog Vegan Yack Attack, cooking food and taking beautiful pictures of it is her passion and “Camera Eats First” is her motto. 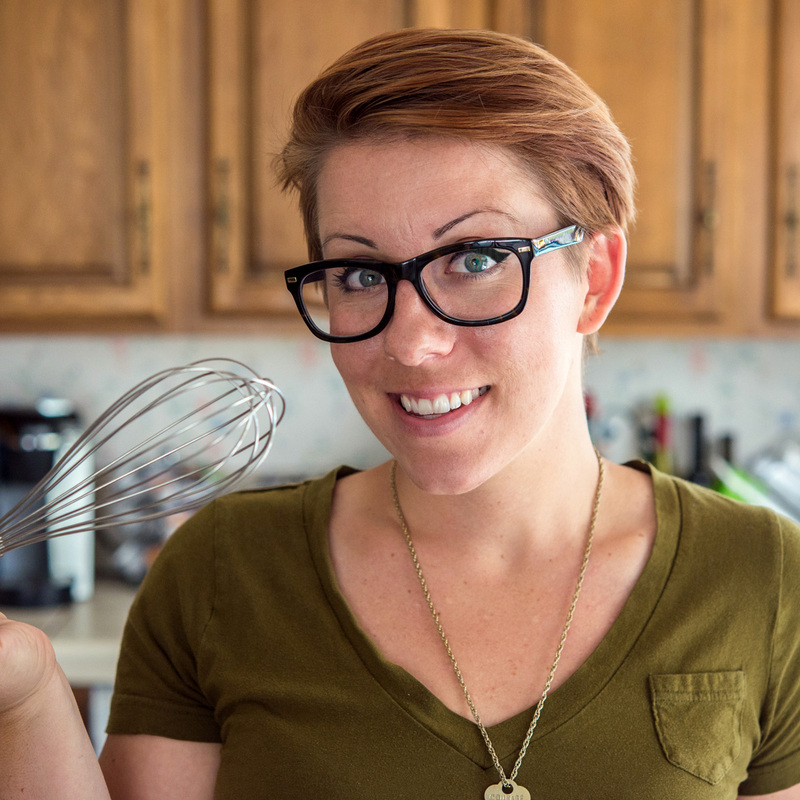 She has worked for Vegan Cuts for close to 3 years, photographed cookbooks for Happy Herbivore and Cupcakes & Kale, as well as for her own eBook, The Great Vegan Pumpkin. She has been featured on VegNews.com, as well as many top vegan blog lists and Chickpea Magazine.